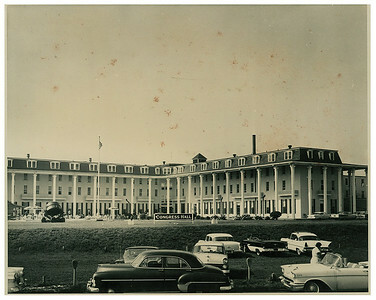 Congress Hall pre fire - year unknown. Old Congress Hall destroyed by fire in 1878. Cape May, NJ. 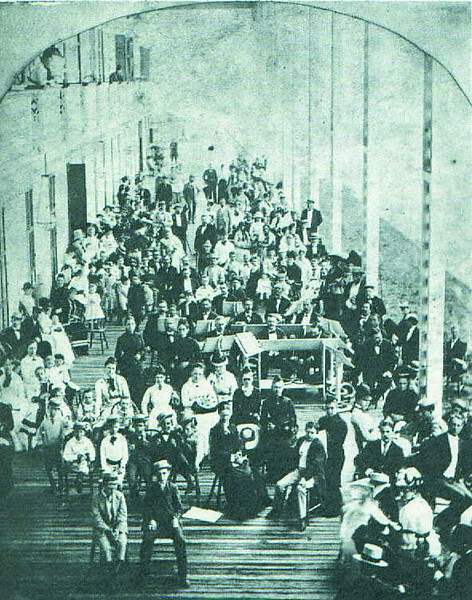 Visitors enjoy the cool veranda of Congress Hall in July or 1877. Even the dog days of summer could not shake the Victorians from their formal dress code. 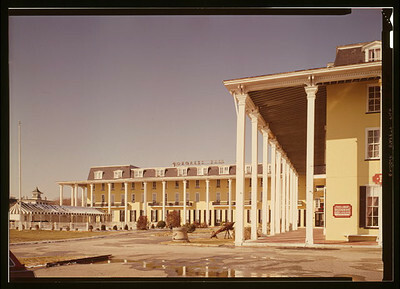 Congress Hall, and to its left, The Windsor., which came under the same ownership as its neighbor in the 1970s, but which burned down in 1979. 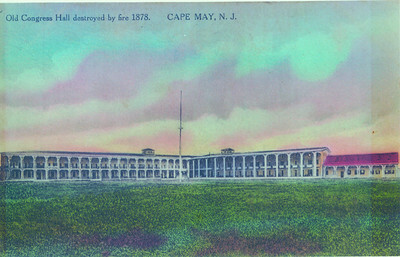 Congress Hall before the great fire of 1878 which destroyed 35 acres of Cape May beachfront. 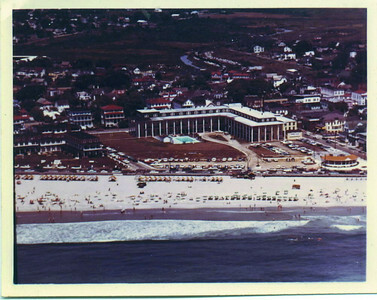 A picture from above - 1950s. 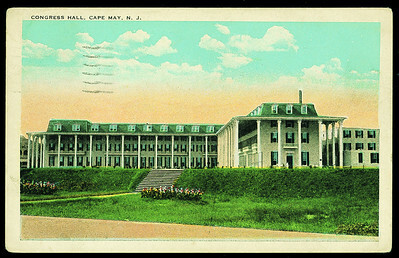 Then, as now, Congress Hall dominates the landscape of Cape May. 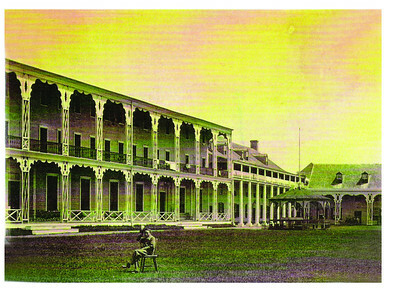 Annie Knight added tennis courts on the Perry Street side and halved the number of rooms at Congress Hall from about 300, introducing en suite bathrooms. 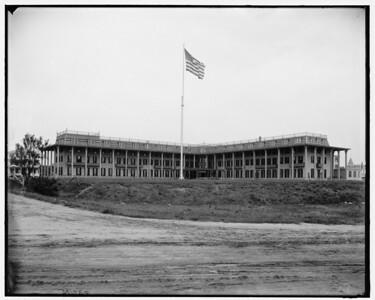 From the Library of Congress - this shot dates somewhere from 1900 - 1915. Congress Hall's staff line up on the lawn in 1928.. The distracted fellow on the right is a tennis pro. 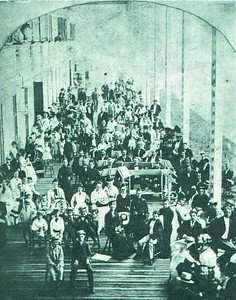 Congress Hall's owner, Annie Knight, is front center. Congress Hall reopens June 7, 2002. NJ Gov. Christine Todd Whitman was in attendance for the ribbon cutting. 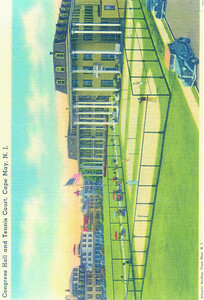 This is a postcard from 1927 during the Annie Knight years. 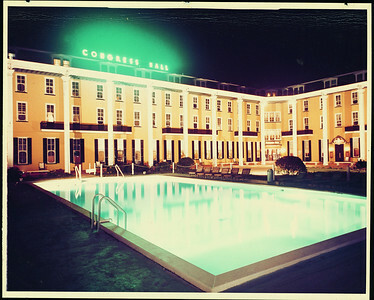 Congress Hall's neon sign came down in the 1980s when it began to fall apart. 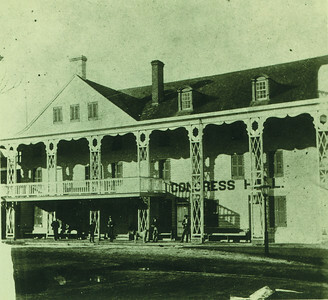 Congress Hall pre 1854 photo - date and era unsure. 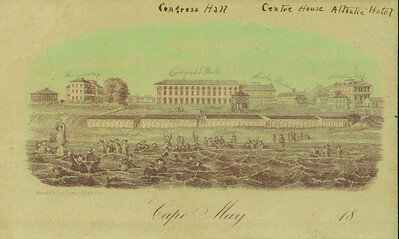 An artist's rendition of Congress Hall from the middle of the 19th century. Congress Hall after the WB Miller renovation of 1854 -not sure of exact date. Congress Hall etching 1877 Jacob Cake era....one year before the fire. 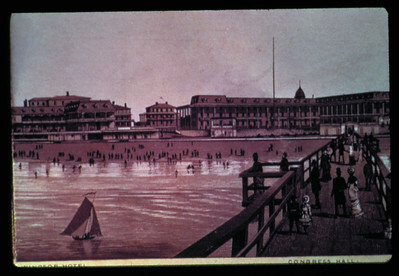 The pier was owned by Congress Hall and welcomed passengers from Philadelphia, Maryland, DC and New York. 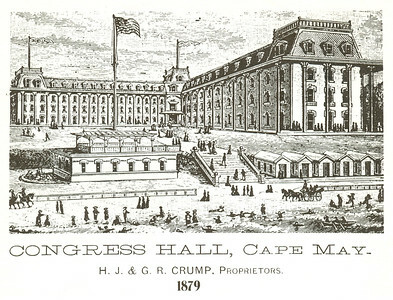 Congress Hall 1879. HJ and GR Crump, Proprietors announce the opening of the new post fire Congress Hall.